I came up with the foam-core idea because I wanted to provide without a shadow of a doubt that the Berger VLD Hunting bullets were yawing on impact and not expanding or fragmenting. The only difference between the .277 130gr vs 140gr vs 150gr is how fast the yaw and penetrate backwards. You can even tell from the test below that the bullet hit the foam-core tail first. I learned a lot more from it as you saw above. great set up you have thank you again for sharing your results. Are thos bullets yawing as they go through the water jug or before the jug? The Berger VLDs start yawing on impact with game or in the water column used in the testing I do. This is my theory. When the density of the medium increases (mammals are basically water), the bullet must remain stable or it yaws. The mushrooming bullets like Accubonds and copper bullets (E-Tip, Barnes, GMX) remain stable because they expand, getting shorter in length and larger diameter, both traits that increase stability. OTMs and most HPs yaw then frament because of their thin copper jackets. I have recovered HP tips that are supposed to "expand explosively" fully intact in the foam-core board - no expansion at all. The Berger VLD's copper jacket are very thick and maintain their structual integrety. The 6.5mm, 6.8mm, and 7mm share the same jackets/thickness. To get the 7mm VLDs to fragment, a hunter down-under has been annealing his bullets to soften the jacket. I have shot 130gr and 150gr VLDs into water jugs at 100 yards and the jug just sits there. The only difference after the impact is the water starts leaking out. The 150gr VLDs travel through the bullet trap tail first. The 130s yaw but not as quickly. The longer the projectile, the faster spin it would need to stabilize. What is the twist rate of your barrel? is it suitable for the projectile length? Projectiles yawing and tumbling INSIDE the animal is good because it creates larger wound than mushrooming alone. Both above principal are widely used for subsonic shooting. My Whisper has 1:7 twist, thus I could use 250 grains projectile which are actually longer than the cartridge brass! The long projectiles requires higher spin to stabilize, but with the huge ballistic coefficient, it remains stable in flight. Also, due to the slow movement, the chance of mushrooming is remote, and thus tumbling is the main kill device in this situation. .270 rifles typically have 1:10 twist and provides a stable supersonic bullet in flight for all the VLDs. A yawing bullet may be lethal but its internal/terminal trajectory inside the game is not assured. I've had the bullets veer off at 30 degree angles after impact. 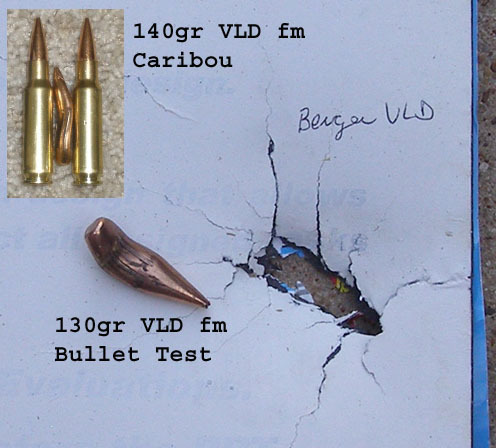 I wouldn't say that a yawing bullet creates a larger wound cavity - not from the test data I've seen (again, for supersonic bullets). The energy transfer from the expanding bullets is impressive. The water jugs are oblierated, the foam-core crushed. Not so for the VLDs. They don't tumble, they rotate 180 degrees and exit tail first leaving an exit wound as small as the entrance wound. Berger claims their bullets are designed to fragment - they don't. I've found them to be very accurate but I need a hunting bullet that is repeatable in its performance, transfers its energy to the target, and I don't have to worry about what direction and how far its going after it passes through the animal. Slim, I think part of the problem with yawing comes about when the tip of a long projectile contacts the target medium it slows down quicker than the tail end of the bullet, causing the tail end to rotate end over end. Once this starts there is no turning back to a stable profile. AHA I see you have been having a good look at that web site I reccamended then... the Shane fella sure seems to know his stuff. I think part of the problem with yawing comes about when the tip of a long projectile contacts the target medium it slows down quicker than the tail end of the bullet, causing the tail end to rotate end over end. If a bullet isn't stable enough for the denser medium, this is sure to happen. I got the same results shooting 150gr VLDs from a .270 Win with 1:10 as a 130gr (shorter) shot from a six8 with a 1:11. The bullets don't tumble end over end, they swam ends and penetrate tail-first. The 130gr VLDs shot from the .270 with the 1:10 were mor stable and only yawed 30 degrees entering the phonebook where the others had already gone past 90. I did contact the manufactures. Barnes replied "Thanks for the great photos and information! It’s amazing how similar they perform." They provided a bullet with a better BC that did almost as well as a 10-yr old bullet so I quess they met their objective. Berger, who BTW is very friendly and responsive - great people, denied it was a problem and suggested a shallower water column. However, when I find recovered bullets from game that match my test, I know its the bullet that is the problem. I found other forums and they are reporting similiar issues including punching through steel plates that are ment for rifles. Not something an OTM is supposed to do. I bought some 150gr Barnes TSX a couple of weeks back & didn't have time to try them before heading back to Blighty. I'm a little miffed with Cabela's because on looking for load data on the Barnes' website, I found the bullets need a 1:9 or faster twist to stabilise - something the information on the Cabela's page fails to mention. I'll give them a try in any case & if they're no use pass them on to someone with a WSM or other with a faster twist. English Mike, I'm surprised Barnes even produces that bullet. Most of the WSM barrels I've seen are 1:10 twist. Their website says 1:9.5 is required. The only 1:9.5 .277 barrels I've seen have been some of the original six8 barrels which are just about all 1:11.25 now. I've run it through two different calculators and the bullet shows it to be stable with 1:10 down to freezing temps. the biggest issue you will have is muzzle velocity vs opening velocity - these two values will end up being pretty close. IMO, It should work to 200 yards with a lot of overpenetration past 150. Very good post Slim, I bought some (100) VLD's in 30/06 (.308) 168gr VLD match classic hunter bullets and I failed to see that it required a twist of 1-13 twist! Tried these bullets in my M700 adl & bdl both with 1-10 twist and accuracy stunk. The Nosler accubonds were the most accurate with the rifles. I loaded the VLD's down in speed and found out they did a heck of a lot better than when loaded midway to full throttle. My best results using these VLD bullets has been with Norma 201 powder with 39.5grs which average 2500-2570fps from chrony. One other thing I would like to note is that SD (standard deviation) is all over the place with newer powders, (rl-17, rl-22, especially Imr 4831). Years ago when you had a load that had minimum SD you had a good load, now lately with newer powders I wonder if that is still true?